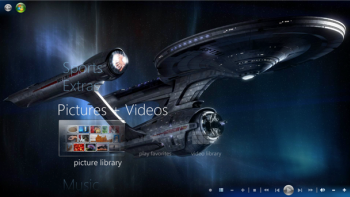 Yesterday we talked about changing Windows Media Center's basic-blue color scheme to a bolder black or white. 1. Click the New button to create a new theme, then click Biography in the lefthand pane. Type a name in the corresponding field. 2. Click the triangle next to Images, then expand Common, Background. You'll see a list of image files below. 3. Click the first one, COMMON.ANIMATED.BACKGROUND.PNG, and then click the Browse button. Navigate to the folder containing the image you want, select it, and click Open. 4. Repeat step three, but this time for COMMON.BACKGROUND.PNG (which is a bit further down in the file list). Choose the same replacement image. 5. Now click the Home tab, then click Save. 6. Click the Themes tab next to Home (above the toolbar), and then click the lower Themes tab (below the toolbar). 7. Click your newly added theme (in the righthand pane) and then click Apply. 8. 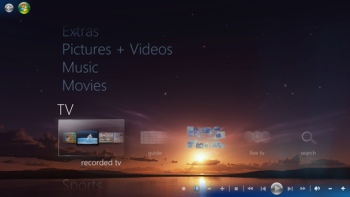 Exit Media Center Studio, start Windows Media Center, and enjoy your new background image. A lot of steps, I know, but the end result can be pretty cool. By the way, I can't take credit for this: the instructions (and sample backgrounds) came from the How-To Geek.